No standardized test is perfect. But anyone who really knows the SAT will tell you that as far as standardized testing goes, it's one of the best.� Why? Because it is very cleverly designed to do exactly what it claims to do: it tests a student's ability to reason.� By reviewing the most common errors students make on the SAT, other students can avoid repeating these mistakes in the future. Writing an off topic essay is the first mistake you can make and it can be a score-killer. Take your time to read and understand the entire prompt.� Spending too long on the intro paragraph and shortchanging the meat of the essay is another common pitfall.� This can be avoided by starting with the body paragraphs and then adding the conclusion and the introduction in their appropriate spots after the body paragraphs are written. Finally, students must learn to budget their time, saving 3 minutes at least to proofread. Grammar, spelling, and punctuation are all evaluated by essay readers. For the critical reading section�s sentence completion questions, students should cover up the answer choices and then read the sentence. Analyze it carefully and make guesses as to what sort of words ought to go in the blanks. Then uncover the answer choices to seek synonyms of those guesses.� The SAT often uses similar sounding words, encouraging�over-suggestibility: students see answers that "sound good" and forget to check whether the words fit what is required by the sentence. The next step is to rate each individual word more consciously. Assign it a plus sign if it works well in its blank. Grade a minus sign if it is certainly not a good choice. Mark a zero if it isn�t clear.� Unfamiliar words get zeros.� Students should only eliminate pairs of words that have one or two negative ratings. Reading too slowly and not understanding the text are the two most important issues students must overcome on the passage-based reading questions. Students should try both of the following methods to find out which works better: 1. Read as though they will be asked to recount the entire passage from memory;2. Skip the passage and go straight to the questions with line number references in them. Don�t be fooled by strongly-worded and attractive sounding answers choices. Students should be aware that the correct answer is often moderately worded, while the answer choices with more extreme or black/white wordings--containing words like "never" and "always"--are often incorrect. Lastly, always consider the tone of the passage.� Try to hear the voice that a reader would use to read the passage aloud. Students need to practice math skills regularly to be comfortable with the math tested by the SAT and to be able to solve the problems quickly.� Don�t get bogged down by mental lock.� As soon as a student reads a problem, that student should immediately begin writing down any possibly-related formulae or pictures that could illustrate the problem. This will also help avoid making careless errors, like dropping a negative sign or adding instead of multiplying. 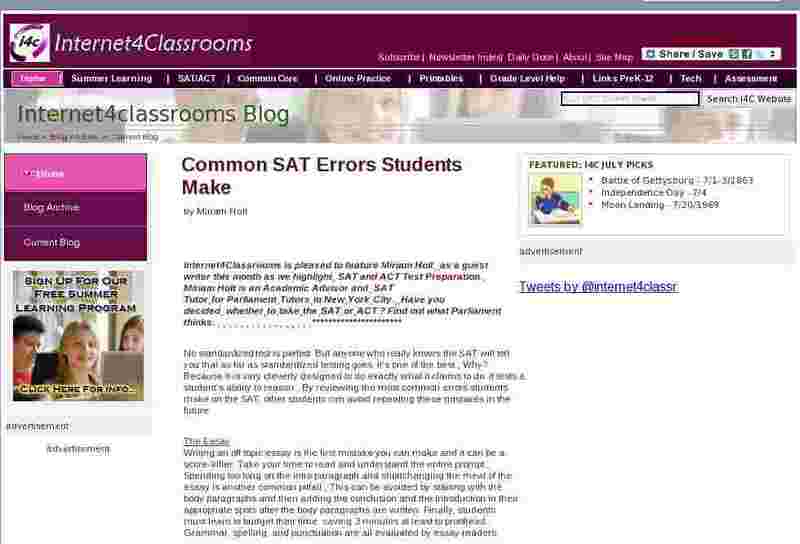 An extremely common SAT error on the math section is answering a question that the problem didn�t ask. The test �tricks� students by asking them to find values that are tangentially related to what a normal person would expect the answer to be.� Students should always read the problem twice before beginning to work on it. This is crucial. Students should remember to check the first page of every math section for useful formulae.� This page includes the Pythagorean Theorem.� The SAT math section LOVES the Pythagorean Theorem.� If it seems to be impossible to find the information a question asks for, it�s probably because a student forgot about this theorem. Students should make sure that dependent clauses with unspecified subjects are placed adjacent to their subjects in the sentence, e.g. �Carrying an umbrella, Carol didn�t mind the rain,� instead of �Carrying an umbrella, the rain didn�t bother Carol.�� Technically, the second implies that the rain was carrying an umbrella. In conjunction with Miriam's helpful tips, take advantage of Internet4Classrooms�SAT/ACT Free Study Guide. �We offer�free online vocabulary quizzes on 5,000 SAT and ACT vocabulary words�and�over 1,000 math problems and quizzes. Students and their mentors will receive reports on their grades, progress, and daily activities. Retake the tests until you master every question.